Please help me welcome one of my favorite new authors, Christine Rains to A Buckeye Girl Reads! 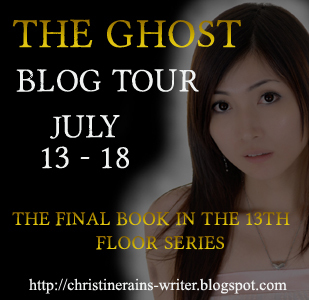 I'm excited to be apart of her blog tour for the newest book in her 13th floor paranormal romance series-The Ghost, which released on July 13th. Chiharo Black lives with six supernatural tenants in a haunted building's mysterious thirteenth floor. Of course, no one knows she's there except the cats. 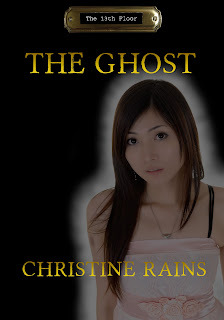 Being a ghost can be a bit frustrating and lonely, but it isn't as bad as her mother made it out to be. Until another ghost intrudes on her territory. Jeremy Emerson wants revenge on the vampire that killed him and won't stop until he has it. To top it off, a nightmarish shade sneaks in and leeches the energy from the building's residents before setting its sights on Chiharo and the thirteenth floor. She can't decide which one is more frightening: the one wanting to eat her soul or the one who might win her heart. Chiharo must convince Jeremy to stand with her against the hellish parasite. If they cannot work together, the greedy fiend will not only drain their energy but everything that supports the thirteenth floor's existence. Not all ghosts get a chance to wander. There are those tied to a certain place, object, or person. I bet sometimes it's not the most interesting place, or maybe it's horrifying for the poor soul. Here are 13 of the most horrible places to haunt. Shipwreck at the bottom on the ocean. The ghost is stuck at the bottom with only fish to keep him company. When you think of how many shipwrecks there are in the world, you can imagine how many lonely ghosts are counting clams. Famous haunted place invaded by ghost hunters. The ghost has done a great job at scaring folks and has become quite well known for it. Unfortunately, she's attracted ghost hunters. All that annoying gear cluttering up the place, the fake psychics spewing some ridiculous messages, and then the annoying ones that try to provoke the ghost by being idiots. I can just imagine the ghosts standing around making snide comments and shaking their heads at the hunters. Amusement park haunted house. There's lots of people to keep the ghost busy, but it's frustrating to scare folks and have them enjoy it because they think it's part of the ride. Landfill. You've seen all the shows. This is one of the most popular places to get rid of bodies. So why wouldn't there be ghosts haunting these places? Mountains of garbage, loud trucks, greedy birds, and more garbage. Then it's buried and practically forgotten. Bottle plant. Sure, there's a bunch of people to scare and things to break, but the noise. Bottling plants are one of the noisiest places to work. The constant whirring of machines and clinking of glass, and if it's a plant open 24 hours a day, the poor ghost will never know a moment of silence again. Cubicle. It's bad enough being stuck in one of those for 40 hours a week while you're alive, can you imagine the torture of it when you're dead? “It's A Small World” ride at Disneyland. That same song over and over over and over. I'm going crazy now thinking about it and I'm not even there. DMV. Slow moving lines, grumpy employees who take no guff, and horrible photos being taken for licenses. I don't know if it's as bad as number 7, but it's pretty close. House of Honey Boo Boo. The horror, the horror! Well. You've seen it in horror movies. A body stashed in a well. Usually the well is closed up too. So the ghost is stuck in a dark little place where no one comes unless by accident. Unless you're a powerful ghost and you have your own video to slip out of the TV to kill people. But these days, a video like that would likely go viral. The ghost would have five million hits. Imagine all those phone calls that would need to be made and murders to be committed. That's just way too much work. Freeway. A lot of folks die in car accidents. There's likely tons of ghosts just wandering the roads. Vehicles zooming by, nothing really to see, and all that noise. Haunted place with lots of ghosts. Places like the Tower of London or the Parisian Catacombs. So many ghosts moaning and groaning. If you wanted some peace, you'd never get it. Pit toilet. I've always been afraid of falling into one of those things. So what if someone had and drowned in the filth? Thankfully ghosts can't smell, but there's no fun to be had watching people go to the bathroom. Well, at least I don't think so! Christine Rains is a writer, blogger, and geek mom. She has four degrees which help nothing with motherhood, but make her a great Jeopardy player. When she's not writing or reading, she having adventures with her son or watching cheesy movies on Syfy Channel. She's a member of Untethered Realms and S.C.I.F.I. The 13th Floor series is her first self-published series. She has eight novellas and twenty-one short stories published.